Its an adventure game by Big Fish Games, Inc. for its young audience. According to developers it will warm your heart and keep you glued to the screen! It’s the story of a boy and his dog. The story of Fetch unfolds through animated cutscenes aimed at tugging the heartstrings of the young and young-at-heart alike.Game will give you extreme fun and developers have developed the game by littering mini games through the game. It was launched this year and have support of around 11 languages. Here’s another Picture editor for your iOS device. By using Repix You can remix your snapshots by “painting” on them using different preset brushes. In technical way, Repix gives you more Photoshop-like control, letting you paint on effects for a more original result. It is available for free but additional add ons in the app will cost you. Its compatible with almost every iOS device. Repix can be downloaded from the App Store. Its a physics based game available on iOS and as well on Android also. NightSky consists many scenes, only you have control a ball, rolling through two-dimensional dark, moody environments with seemingly no purpose but to enjoy the ride. Game immerses you in its virtual world: Each environment is rendered with consummate imagination and care. As according to gameplay it have tight controls and effective ambience which make it one of the best physics platformers around. You can download it by shelling out $4.99. Head over to the App Store here. Freeverse, Inc. is now offering Skee-ball 2 for free in the App Store. All you need to do is roll the ball up the ramp and into one of the numbered holes. Play by simply flicking your finger across the screen or making a bowling motion. A fun, amusing bit of nostalgia for those who remember rolling a wooden ball up a ramp into a plastic cup. Its available for free in the App Store. 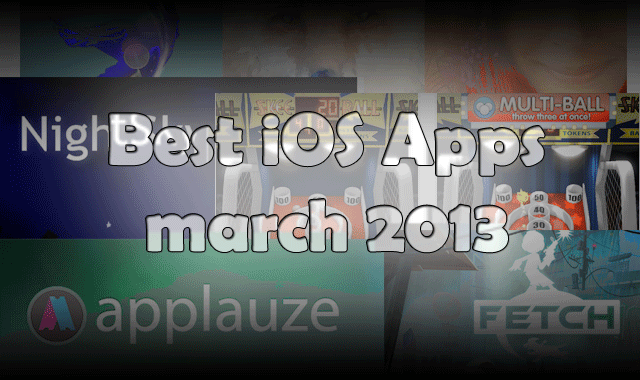 Also check our best ios app of february month. Bored at home? Than get out of your home and enjoy events in your city by searching hem on Applauze. Despite searching events it also helps you to book tickets and that too at lowest prices. In other words it helps you to discover, plan, and attend the best events around you. Its available without any cost in the App Store here. For more Best Articles head over to the Portal here. Share your best apps via comments below.